There is still a lot of room for improvement of taxation: many local governments lack the capacity to improve their source optimisation, perform local assessments and to hold information campaigns to involve local stakeholders and explain them what they are paying taxes for. They also need to commit, to high management and transparency standards, by promoting citizen participation through issuing regular financial information, and by strengthening their capacities in finance and investment. 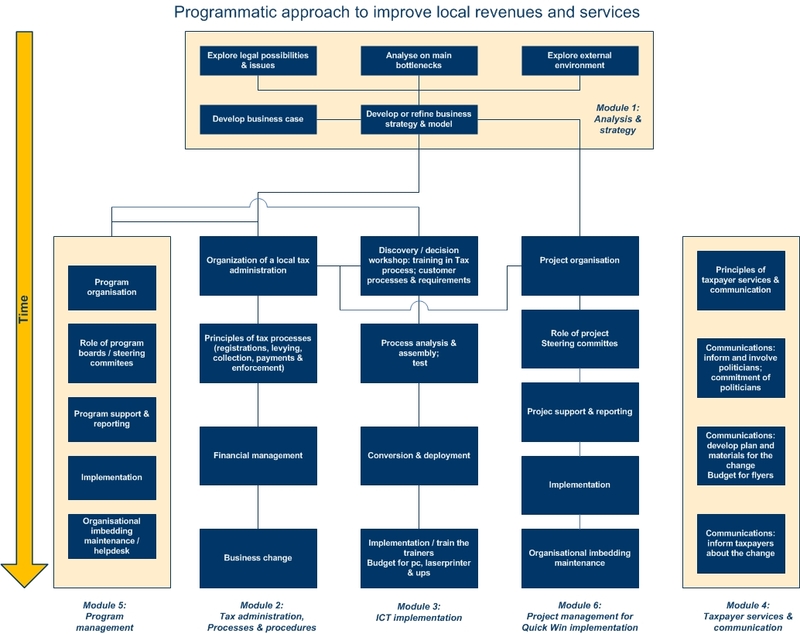 In order to address these and other needs relevant to improving local taxation, VNG International has developed a programmatic change approach. This approach is characterised by focusing on practical, technical improvements, instead of a policy-focused approach. With this approach, consisting of six modules of which the perfect mix can be chosen depending on the context, new capabilities, processes and procedures are introduced, together with IT solutions. Assessing the legal framework, after which a strategy based on costs and benefits will be drafted that seeks to improve the local tax system. Taxpayer communication, improving service delivery as well as accountability and transparency about local government expenditure. VNG International’s approach has been piloted in Elmina, Ghana with very positive results: comparing the local tax results of 2014 and 2015, the amount of properties assessed and taxed nearly doubled, the taxable value increased by 11 times, and the actual total amount billed grew twentyfold. This increase in tax collection represents a great opportunity for the services provided by the local government. It also helps to create awareness by the citizens that services cost money and need to be paid for, both for usage and for maintenance. UCLG calls on the international community and development agencies to recognize this huge potential and to support this type of technical assistance to local governments to improve their own tax revenues.